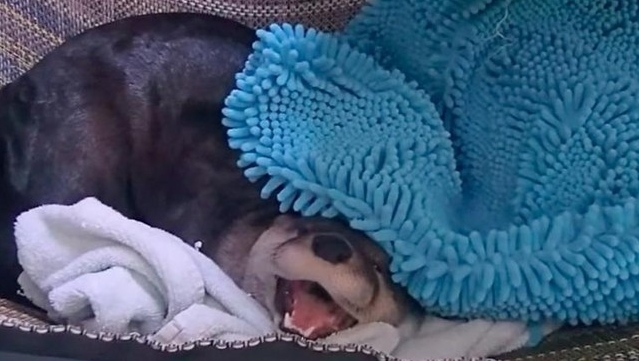 Ryer the river otter is basically just like a human teenager — he loves snacks and hanging with his buds, and he really hates being woken up in the mornings. And then he full-on yells at her before shoving his head under the blanket and going back to sleep. Watch the whole video — and turn up the volume so you can really hear Ryer's complaints. Communication: River otters can produce a snarling growl or hissing bark when bothered, and a shrill whistle when in pain. When at play or traveling, they sometimes give off low, purring grunts. The alarm call, given when shocked or distressed by potential danger, is an explosive snort, made by expelling air through the nostrils. Responses to " Rescued Otter Has The Funniest Reaction To Being Woken Up "
love otters..a great little video..thank u.